PahaQue Wilderness Awning Pole Kit by Paha Que Wilderness at Mountain Walk. MPN: AP100. Hurry! Limited time offer. Offer valid only while supplies last. PahaQue Awning Pole Kit allows you to add additional shaded area to any PahaQue Tent, Cottonwood XLT, and Screen Room's with built-in awnings. PahaQue Awning Pole Kit allows you to add additional shaded area to any PahaQue Tent, Cottonwood XLT, and Screen Room's with built-in awnings. Includes 2 Straight shock-corded poles, two adjustable guy-lines, and two heavy-duty ground stakes. 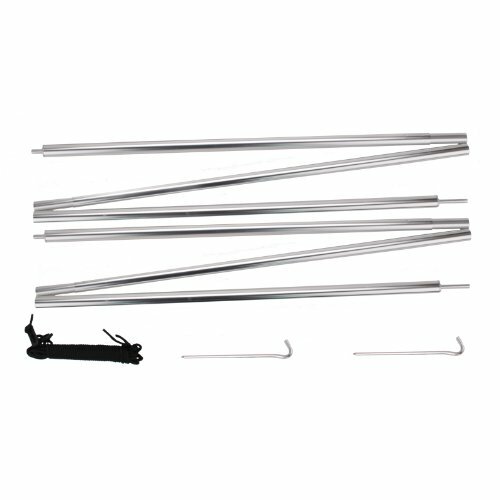 Specifications:- Size: 160cm- Material: T6 6061 Aluminum Alloy, 19mm- Weight: 4 lbs. If you have any questions about this product by Paha Que Wilderness, contact us by completing and submitting the form below. If you are looking for a specif part number, please include it with your message.